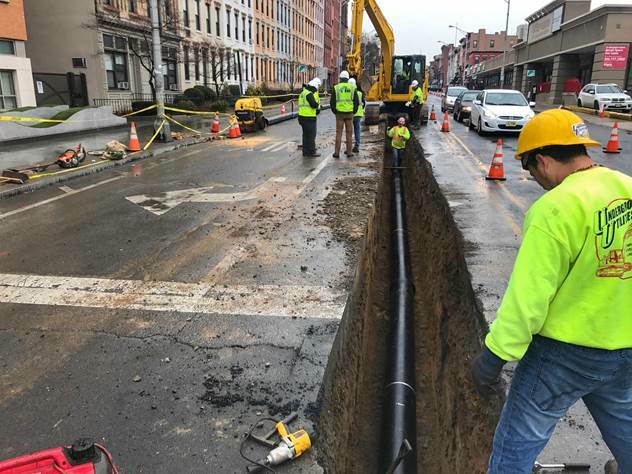 This morning crews working on the $7 million Washington Street water main upgrade installed the first sections of 12-inch pipe to replace the century-old water mains. As part of the $17.5 million Washington Street redesign project, all of the old water mains from Observer Highway to 15th Street will be replaced. The City’s $7 million investment includes upgrading the 12“ main on the west side, the three 8” main sections on the east side, and fire hydrants on Washington Street. The project will also upgrade 531 service line connections to new valve boxes at the curb. “It is important that the service lines be upgraded as well so that we can prevent having to dig up Washington Street after it is newly paved,” explained Mayor Zimmer. The City is also currently working on a $5.2 million plan to upgrade water mains in other priority areas and has issued an RFP for engineering design for this work. Additional information on the Washington Street project is available at www.washingtonstreetproject.com. Grist for the Mill: Ready for Launch?